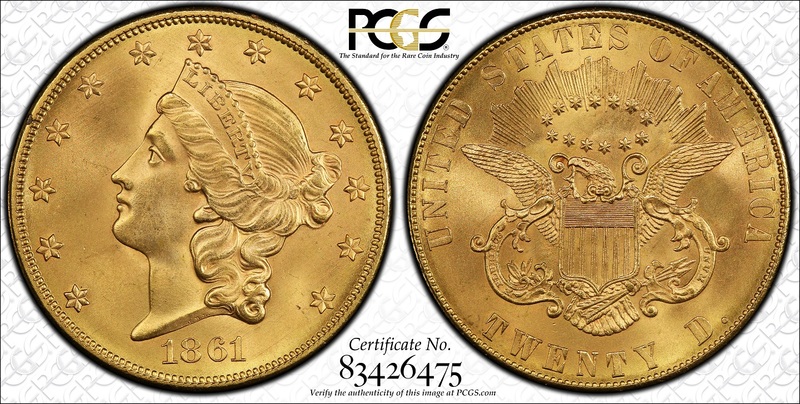 The finest known 1861-P Paquet Reverse Double Eagle was recently graded MS67 by PCGS. (Newport Beach, California) — The finest known of only two 1861 Philadelphia Mint Paquet Reverse Double Eagles has been graded MS67 by PCGS. The rare coin, formerly owned by King Farouk of Egypt and known as the Norweb Specimen, is insured for $8,000,000 and will be publically displayed at the upcoming February 16-18 Long Beach Expo. "PCGS is honored to grade such a rare and important coin. 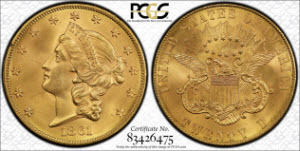 Now that the Norweb Specimen has been graded PCGS MS67, both known 1861-P Paquet Reverse Eagles are graded by PCGS, the other being the PCGS MS61 Dallas Bank Specimen," said PCGS President Don Willis. Of all regular issue U.S. Double Eagles, the 1861-P Paquet Double Eagle is the rarest. For years, this coin was considered a pattern, until research concluded the coin was meant for circulation before the mintage was melted down after a defect in the dies was discovered. Somehow, two examples survived. 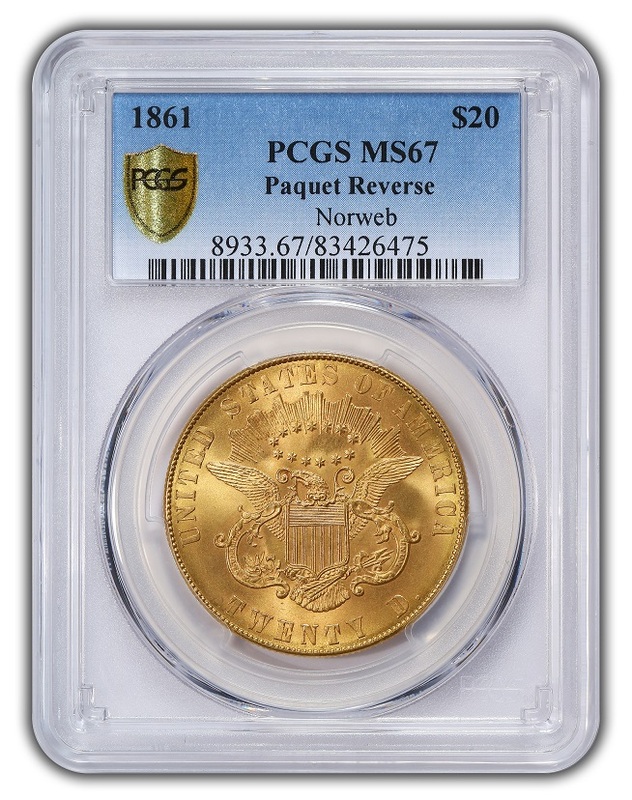 "This Paquet Reverse is one of the great United States gold coin rarities and one of the best coins PCGS has ever graded," stated PCGS founder, David Hall. A high-resolution TrueView image of Larry Lee’s famed Paquet Reverse, graded PCGS MS67. The pedigree of this virtually flawless 1861-P Paquet Double Eagle dates back to the Woodward Sale of March 1865, when the coin sold for $37, a remarkable price for the time considering the coin had been struck only four years prior. The 1861-P Paquet Reverse was recently privately sold by Brian Hendelson, President of Classic Coin Co. of Bridgewater, New Jersey, for an undisclosed amount to Larry Lee, President of Coin and Bullion Reserves of Panama City, Florida. "When a coin of such pedigree becomes available, you have to jump on the opportunity. It has been called virtually flawless; it has been called perfect, and it has been owned by leaders of the numismatic field throughout its fascinating history. I am thrilled to have this coin, now graded PCGS MS67, in my collection," said Larry Lee. The differences between a standard Double Eagle reverse and the rare Paquet Reverse. 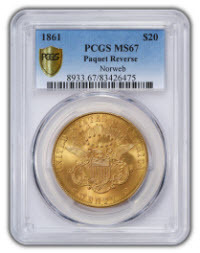 PCGS CoinFacts (www.PCGScoinfacts.com) states that the 1861-P Paquet Reverse is slightly modified from the regular version. When engraver Anthony C. Paquet of the Philadelphia Mint began designing the reverse in 1859, he endowed slight yet notable differences. The coin’s lettering on Paquet’s version is tall and slender compared to the short, broad lettering of the traditional reverse. Also, the crown-like display of stars positioned above the eagle’s head is larger on Paquet’s coin, with the top stars prominently displayed beneath rays of sunlight. The same stars are partially buried on the regular reverse. The rarity will make its first West Coast public appearance in the coming weeks, courtesy of Larry Lee, at the Long Beach Expo (www.LongBeachExpo.com). Visitors to the show, held February 16-18, will have the opportunity to view the coin in person at the PCGS booth. Free passes to the coin show are available using the promo code EXPOPR. For information about PCGS services, including the current February 2017 Crossover Special, visit www.PCGS.com or call PCGS Customer Service at (800) 447-8848.